0/6MO - £24.99 Only 2 left! Everyone goes absolutely gaga when it comes to bunnies and we can’t blame them! They are just so cute and fluffy! And don’t get us started on those floppy ears and all the tiny poofy tails. 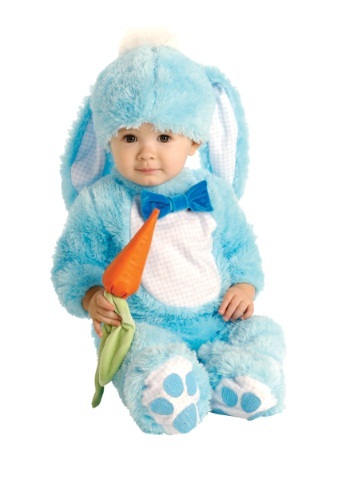 Now, you can easily kick your infant’s cuteness up a notch when you grab this Baby Blue Bunny Costume. Is Halloween right around the corner? Is Easter hopping closer with every day? Do you just have a sudden desire to have an adorable photo shoot with your little bundle of joy? Well, once you dress your tiny crawler up in the Blue Bunny Costume, he or she will be ready for any of those occasions! The baby blue romper has paws printed on the bottom of each of your little one’s footsies and it even has a charming bow tie attached below the neckline. It will make your knee-high hopper, not only the cutest bunny on the block but the classiest as well! Now most high-class rompers, such as this, are topped off with a fancy top hat of some sort but this costume goes a different direction. Instead, a delightful pair of floppy ears along with a poofy white pom-pom sits upon your baby’s crown. This adorable transformation is then made complete when you hand your wittle wabbit the cutesie carrot rattle to shake about as he wishes. Grab this Baby Blue Bunny Costume for your little one and get the camera ready. You won’t want to miss a single moment of your kiddo smiling and bouncing around in this darling outfit!